After the motor was carefully re assembled it needed preparation and painting. 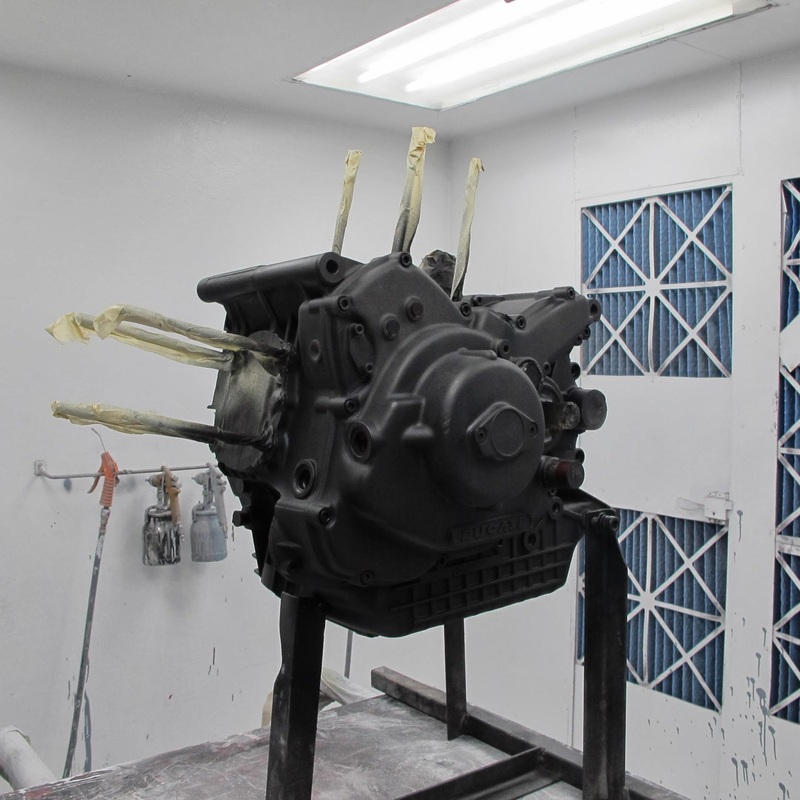 Matte black primer looks pretty cool. - Magnesium Gold for the covers. The Pictures don't really do the colours justice. The end result is both lush and technical. I'm stoked. 10) Things Get REALLY Outta Control! 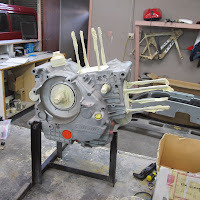 I'd decided that if I was going to go to the trouble of new engine cases and gearbox, then I should go all out. The objective was to make the bike 'mint'! And go as good as it looks! It had 82rwhp before so, with some careful tuning, 95+ might potentially be achievable. And so, armed with only a laptop and my trusty credit card I went completely nuts. Most of the stuff I bought new and was soon winging its' way to NZ from the 4 corners of the globe. I figured I'd go "OMG What have I done???" when I got my credit card bill! • ‘95 Upper Triple Clamp in his own brushed stainless finish. 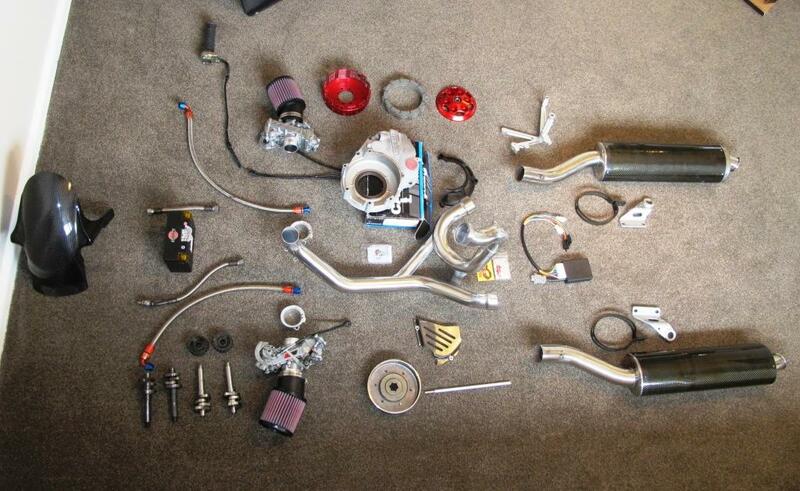 And this is what some of those bits and pieces looked like. I was very fortunate not to suffer serious damage in the quakes and the Insurance Company agreed to pay for the cosmetic damage to the bike. I couldn't exactly ride it with a fine oil mist spraying onto my boot, and the bike had developed a bad smoking habit, so I decided to go all out and make it into the bike I always wanted. Enter Murray Sutherland from Muzza bikes. 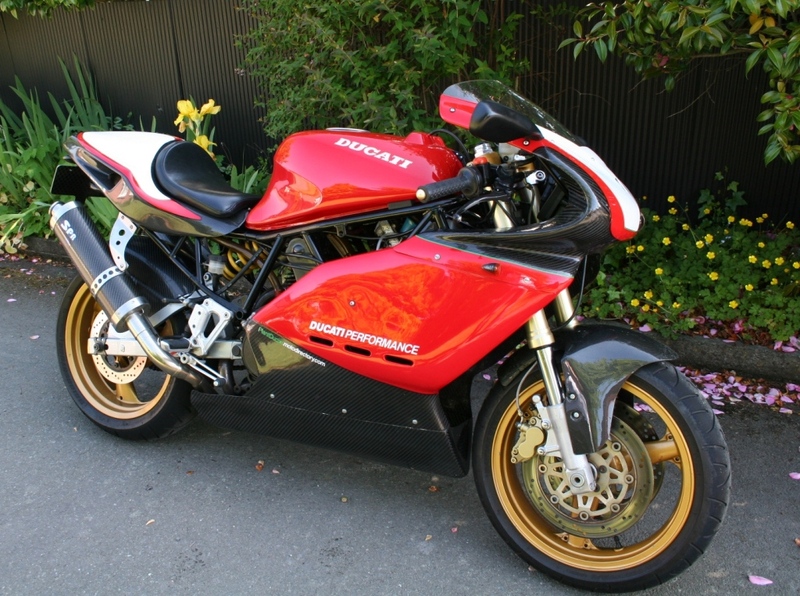 Already my Ducati-part “drug dealer” Muzza supplied me the 1000SS swingarm and rear wheel, a front wheel to match and a whole of lot of other bits and pieces, which I didn't need, over the years. 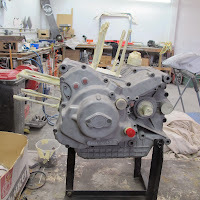 The plan was to have Muzza do the valve guides, port and polish the heads and paint the motor. And so began the strip down. Typically, immediately we found things awry. 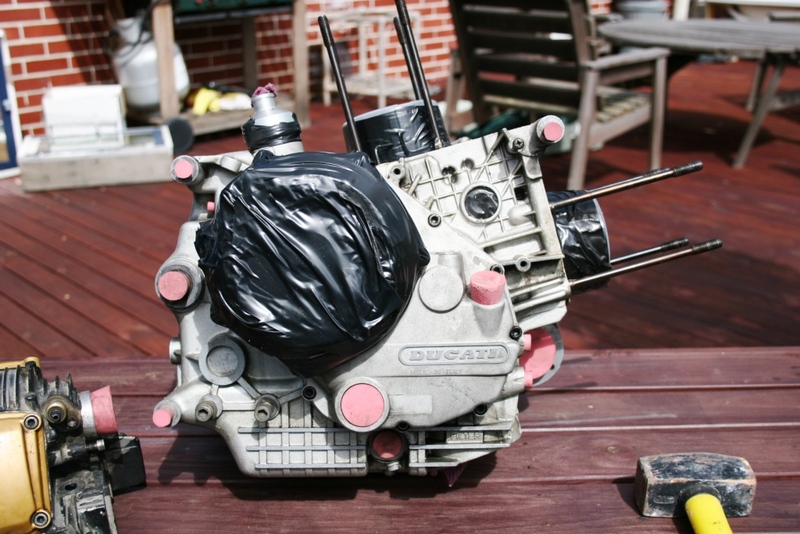 Pulling the motor out revealed some previous ugly repairs to the engine cases. Front motor mount repairs, not done to a high standard! 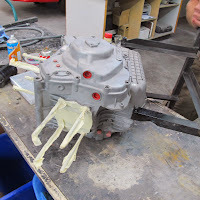 Of course Muzza just happened to have a newer set of cases with a close ratio box, and a big bore exhaust system sitting in the corner of the workshop. 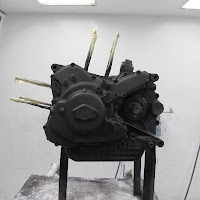 First I prepped the motor before it went off to the media blaster. This is where I made my first mistake. I used a guy who did Walnut Blasting because I didn't want to use harder media (sand, beads, etc) or Soda (not inert enough). While the finish was fine, despite me having sealed my motor to the best of my ability, Walnut ended up everywhere! Had I not been replacing the bearings in my motor, I would not have been very happy! 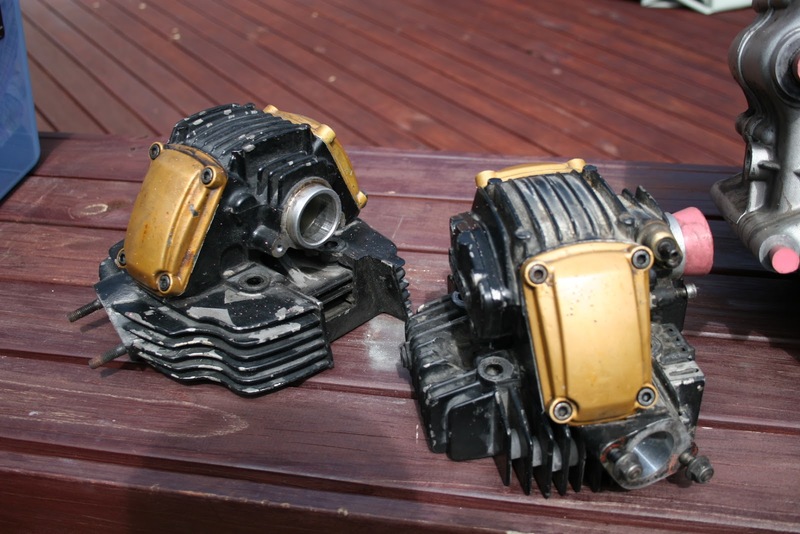 Ducati motors are pretty porous too so you need to use something which is as lightly abrasive as possible. In hindsight, I would have tried Vapour Blasting. Another name for this process is vaqua blasting, (US friends use vapor when searching.) It uses beads mixed with water and sometimes solvents. The water also helps keep the part cool as blasting imparts heat. Visually the results are stunning, but obviously try this at your own risk. I'd be interested in any comments as to your experience, especially from people in New Zealand. In September 2010 Christchurch suffered a 7.3 magnitude Earthquake. This was followed in February 2012 by a 6.3 which was even more destructive. While my house was in one of the less affected areas of town - the Earthquakes wrought terrible destruction. The Superdue fell over in the Feb quake suffering minor damage. 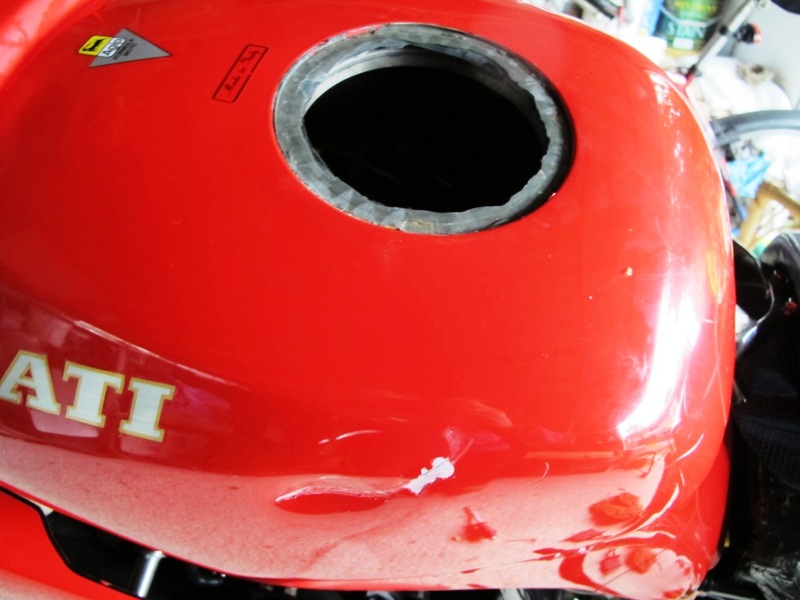 The right side fairing and tail fairing were damaged, the RH minor and indicator broke, the frame was dented and the sidestand bent. It must've fallen on that first when it jumped off its race stand. 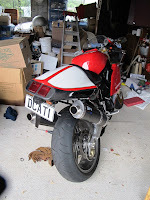 Actually it was amazing it (and my garage) didn't burn to the ground because the bike was on the battery charger that day and, when it fell over, the tank hit the ground, the entire filler cap broke out of the tank and petrol spilled everywhere. I'm sure petrol vapour and live electricity are not a good combination, but it clearly want the bike's time. 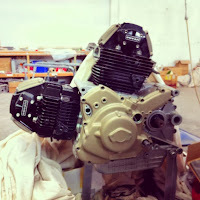 One of the cylinder heads also got whacked and an an oil leak appeared when I started the bike. Damn. 7) Finally I'm "over it"
Like I said, some of my mates had all got sick of me and my ever present tool kit, doing roadside fixes, but my biggest bugbear by far was the electrics.Fast forward to 2010 and as it would turn out, the last time I would go out on this bike for nearly 3 years! 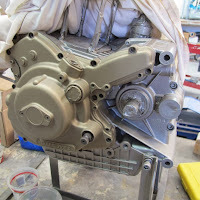 (I'd planned a spin with my best mate, a Triumph 675 Daytona riding lawyer with no mechanical aptitude) Of course, at the first gas station we came to, the starter solenoid went pop. He was very unamused; another ride ruined by my unreliable Ducati. "Dont worry, I said, I can fix this" and started walking the bike away. "Where are you going??" I pulled out my screwdriver, whipped the tail off, pulled out my wallet, stuck the screwdriver in it and held it across the solenoid terminals until the bike started. Was almost worth it for the look on his face as the sparks flew and, for all intents and purposes, I electrocuted myself. Answer: A safe distance from the pumps. I cant remember at what at what point things started to get really out of hand, but it was some time in 2008 when we really bonded. My mates who rode it could never figure out how I managed to make the bike go so fast. 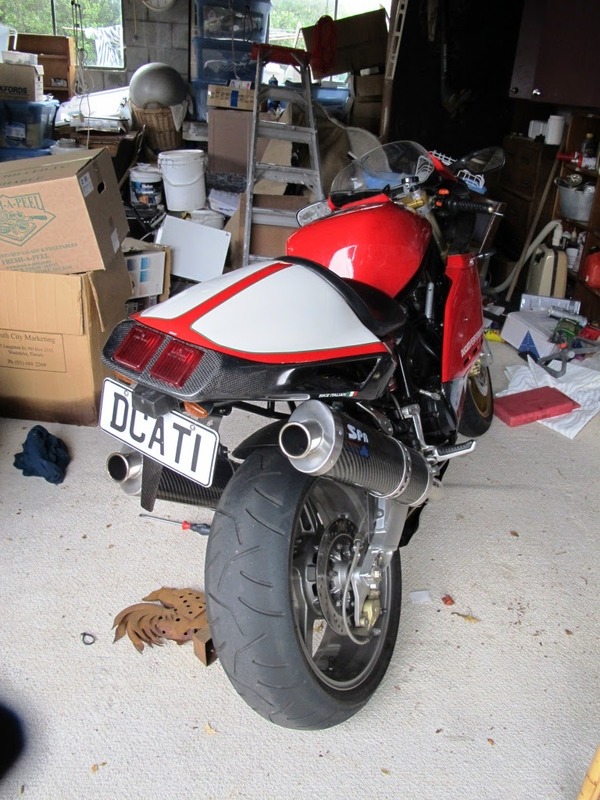 That Summer I enjoyed many rapid ride around the hill roads of Banks Peninsula so my riding skills were becoming honed. 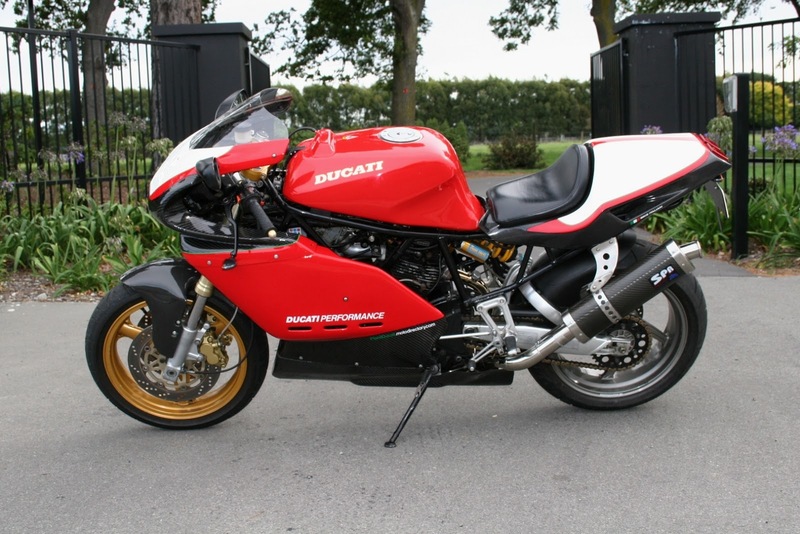 To be honest the thing went better than any old Supersport had a right to. 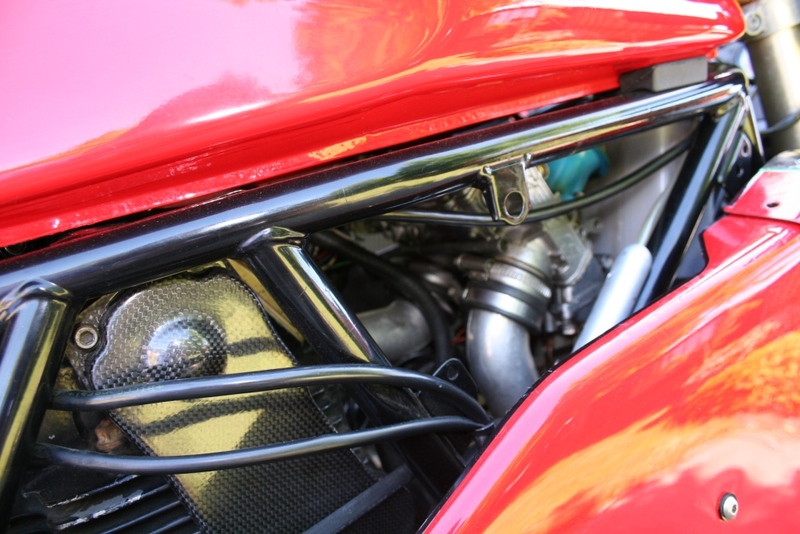 Its' (unfiltered) FCR carbs sucked so hard that you could feel the change in air pressure in your ears when you wrapped on the throttle, let alone hear the deafening noise of air, bugs and low clouds being forcibly ingested into its 944 cee cees of high compression hammer-hell. The front came up at 4,000rpm in 2nd off the gas, which never ceased to impress me and the cancer of unreliability seemed almost in check. It had carbon everything, I had bought an Ohlins shock from local Ducati Wrecker Ducatispares, the bike had a Romeo Y Julieta Churchill aluminium Cigar case (from a cigar that I had personally smoked) for a battery overflow container. It was, in short, as cool as hell! 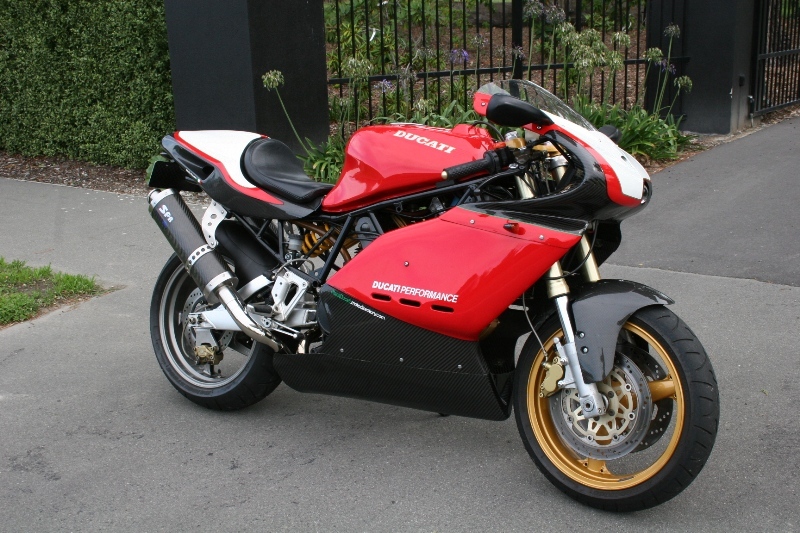 However, cool is a relative term, so when I discovered that the swingarm was made of common steel, not the aluminium found on later bikes, I went on the hunt for the best 2v Ducati Swingarm that I could find. Which at the time was from a 1000SS DS. 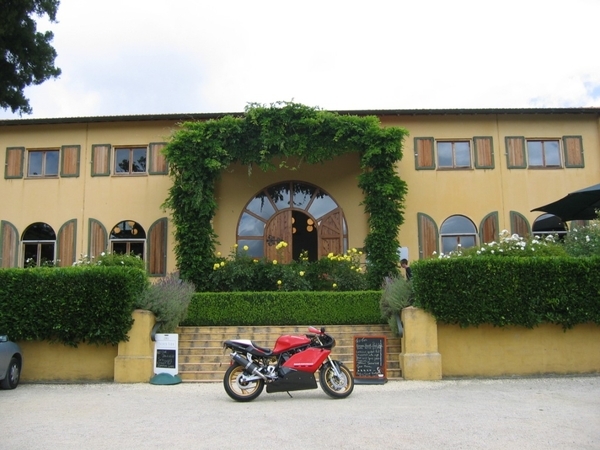 My quest led me to the door of Muzza Bikes, a shop that specialised in Motorcycle Smash Repairs, and all things Ducati. 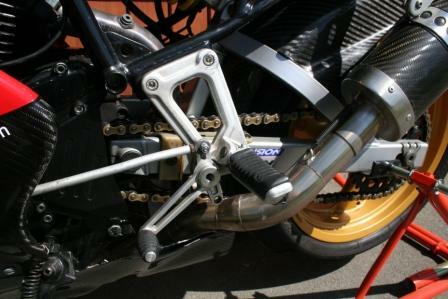 Murray, the owner did indeed have a swingarm, but also the entire rear assembly, wheel, brake, etc that went with it. At this time I was still suffering from a Purple single pot rear caliper that looked like it had come off someone's Grandad's R-Series BMW. So I bought the lot. 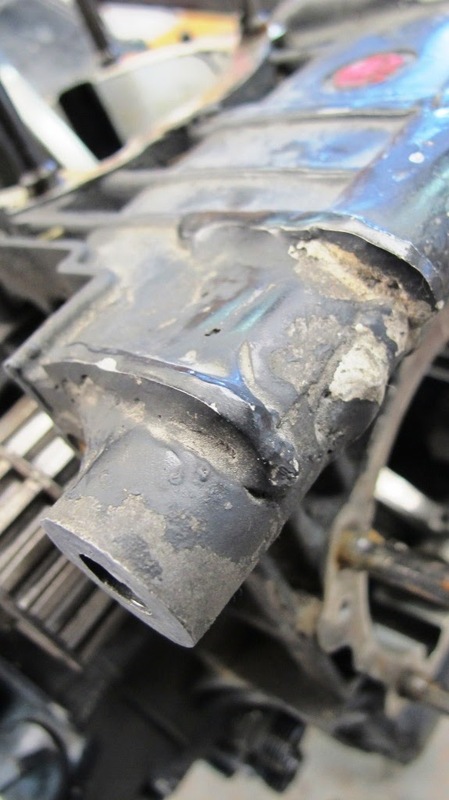 When I trial fitted the later model swingarm, I discovered, to my horror, that the Spaghetti exhaust system didn't go in the smaller gap for the rear cylinder down-pipe. It would need some modification to fit. More research led me to a bloke by the name of Corey, an exhaust welding guru who had also done some work on the Britten. 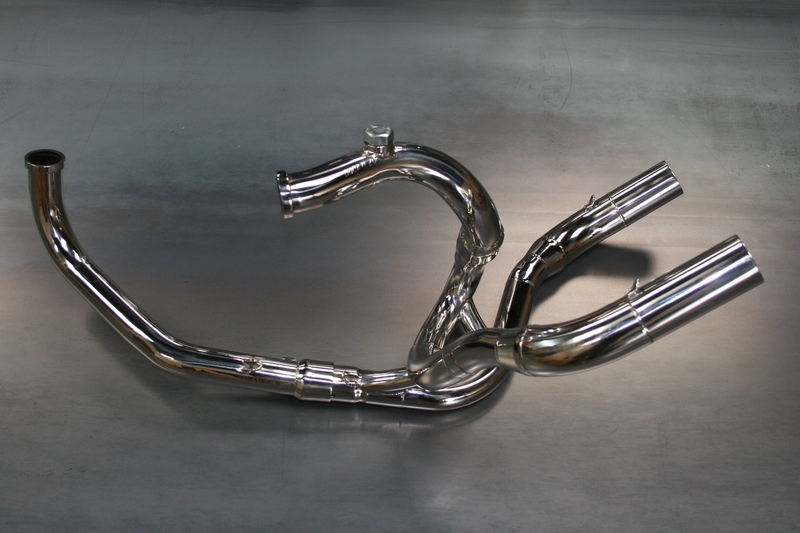 Corey crafted the necessary modification to my system, made the balance pipes more substantial and added some Lambda probe fittings, so I could get meaningful results on a dyno. 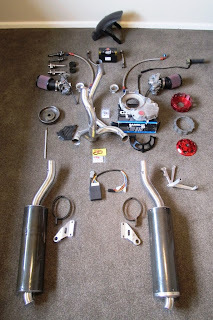 Taking it to a local shop revealed 82.4rwhp, and oodles of torque. Many people would have given up long past this point, but I refuse to be beaten, and be it due to my tenacity or pig headed stupidity, I carried on with my grand plan to make the bike what I wanted it to be, not what IT wanted to be. This is where the addiction really took hold. All too Avant Garde for me! First thing I did was re-paint it. The paint was pretty average in places and the previous owner had a heap of stickers on it (cleared over unfortunately). Not my thing. Also 'not my thing' was the PURPLE brake calipers. (Hmmmmm) Of course, because I had the annoying braking issues, I figured I might as well rebuild the calipers before I got them painted (a nice tasteful gold). 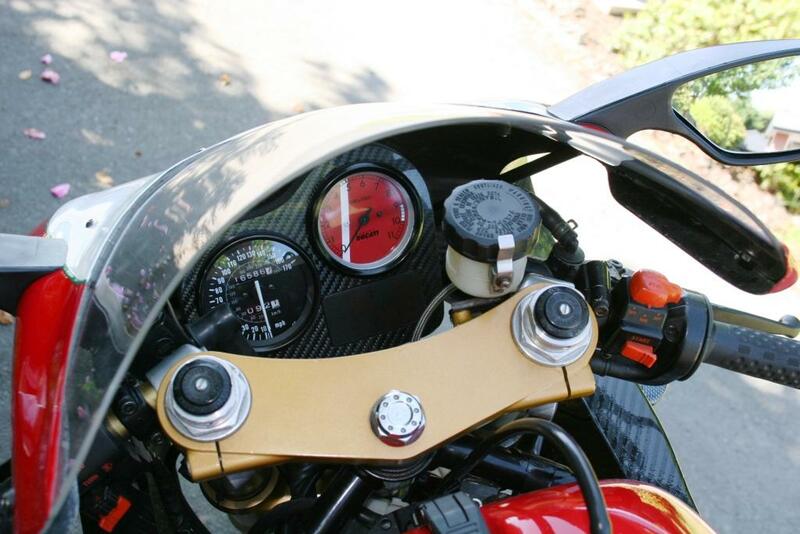 Because the custom subframe was set so much lower in order to accommodate the Supermono fairing, the Ignition Barrel obscured the instrument panel. The answer was (obviously) to cut the housing off the top triple clamp and mount the barrel on the frame between the V. A bit of media blasting was required, them some paint to match the lower triples and gold wheels. 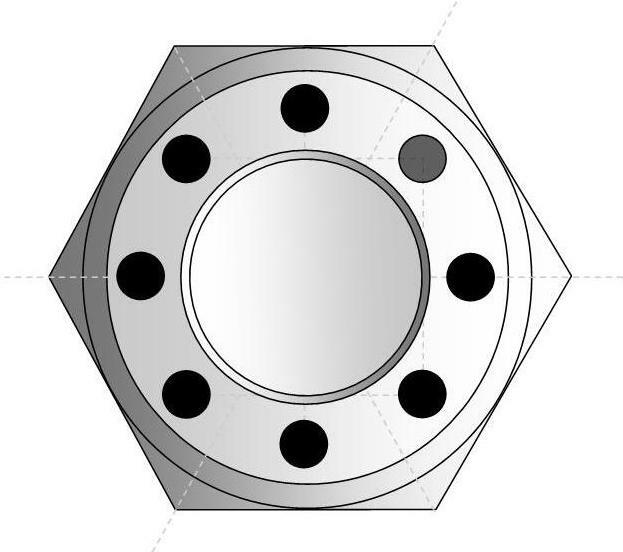 The headstock nut was standard Kawasaki and pretty rough so I designed a new one. Custom head stock nut design. I took my design to my old mate Rob Selby from Britten Motorcycle Company. 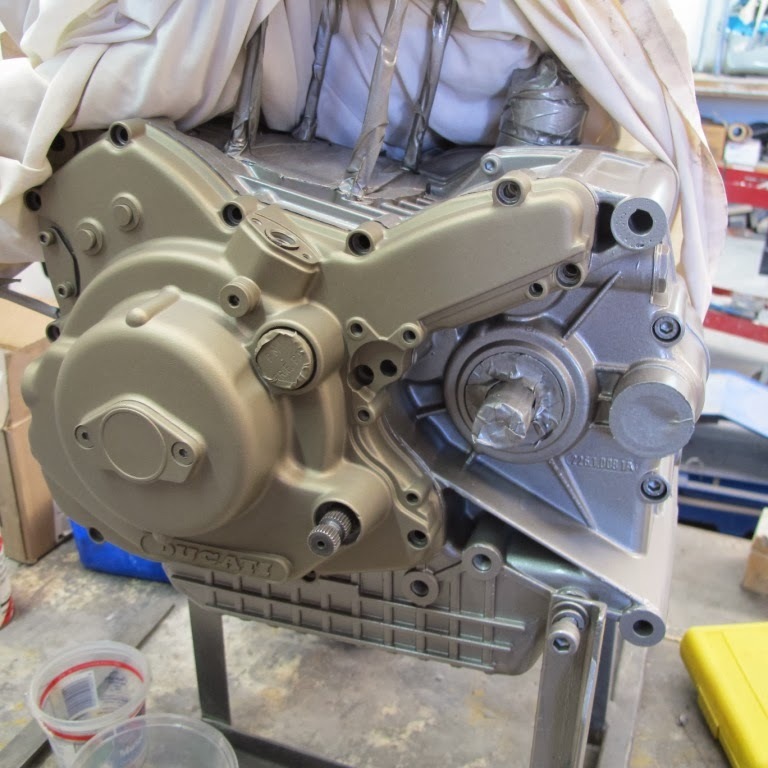 Rob machined a lot of the one-off special parts for the Brittens and now works for a company that restores exotic cars from all over the world, old Astons, Bugattis, Ferraris etc. 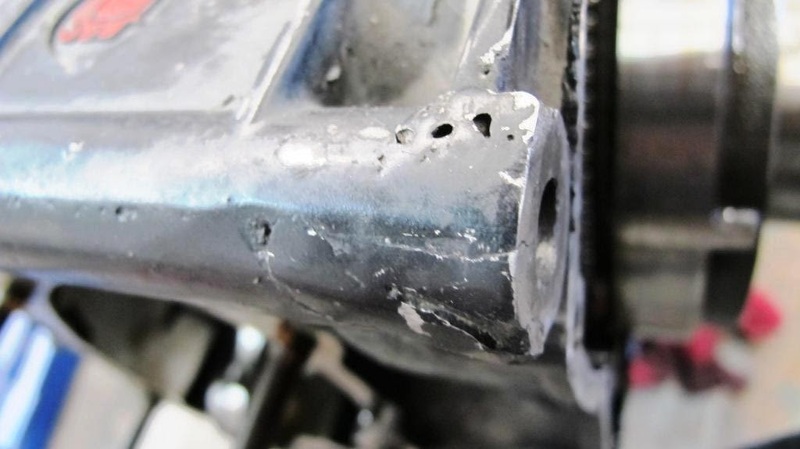 Another thing I noticed was the gearshift linkage fouled the fairing. Rob made me a billet alloy footpeg adjuster, and I got him to mill out my gear lever & foot brake lever while h was about it. Already the bike was starting to look a bit more purposeful. 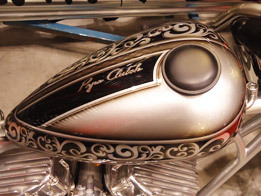 After over $800 in paint for the fairings, upper triple, calipers, (not to mention the cost of machining) I decided the dash, which was in poor shape, needed a freshen up as well, so I bought a new unit, designed a custom tacho face, and got a carbon fibre instrument cover made. Here's the end result (including the nut Rob Selby made me). 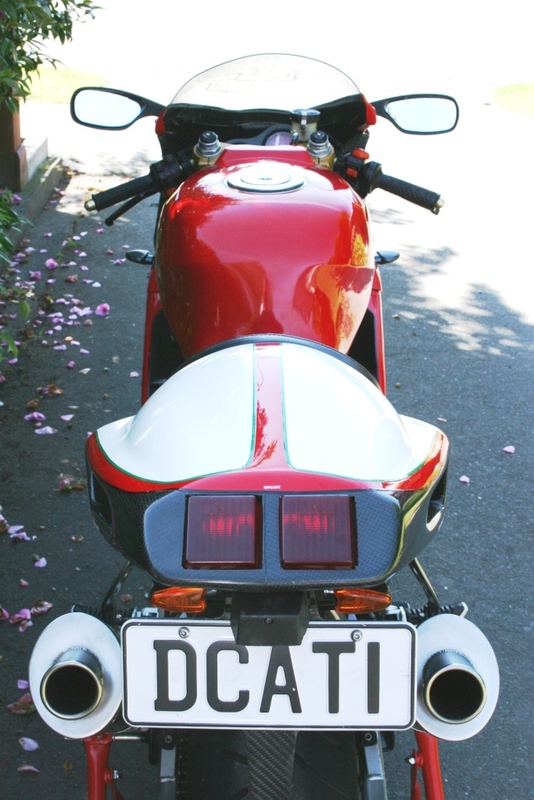 A few years ago I'd bought a personalised plate: DCATI. So, I got the guys who made me the carbon fibre instrument cover to also make a carbon number plate holder (tail tidy). The QB Carbon 955 Corsa tail fairing differs from all other 916 fairings in that it has a rounded hump rather than a flat top with vents. Again, just that little bit different. 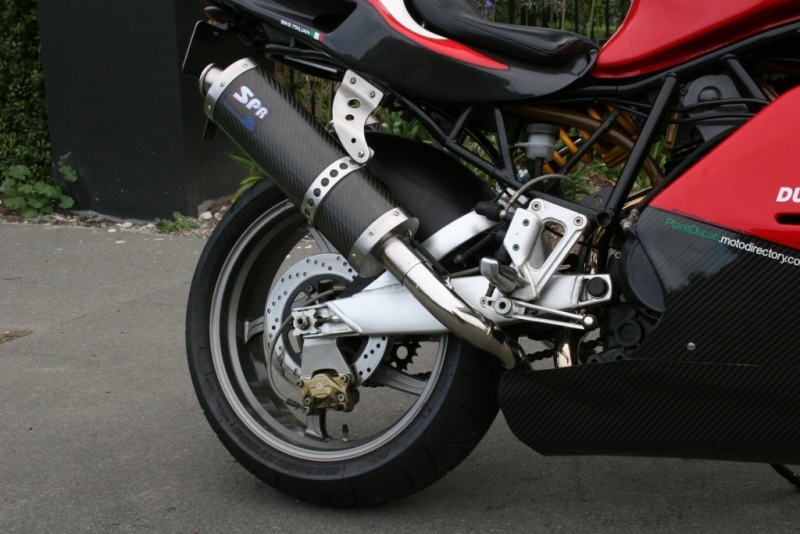 A set of carbon fibre cam belt covers also managed to find their way onto the bike. Before we go totally down the Rabbit Hole and as you get deep into this blog (and you will come appreciate just how deep it is!) it is appropriate that I issue both a warning and a disclaimer. 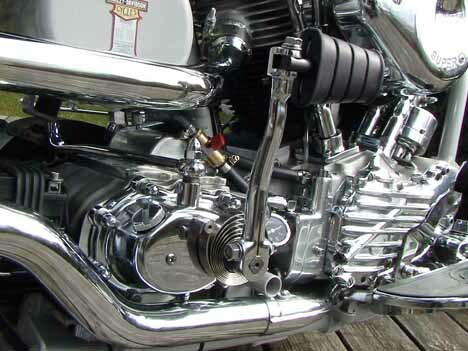 When building a custom motorcycle, consider that everything you change will have a flow-on effect. And that effect will possibly have an additional (flow on) effect. THINK before you change stuff. The internet is your friend. Forums are FRIENDS. Learn from the advice and mistakes of others. If you're planning on becoming an Obsessive Compulsive Modifier you will have good days and bad days. I'm not a trained mechanic, so in most situations I only kinda know what I'm doing. Over the years I've learned by trial, error, Haynes manual and the occasional sage advice from my mentors - an A-Grade qualified mechanic, whose workshop I am graciously allowed to use, and my Dad, who is a highly qualified Engineer and probably the cleverest engineering problem solver you could ever meet - when they have time! Even with help, sometimes I'm out of my depth and sometimes I'm totally over it. (Usually when I "F" something up.) Having the attention span of a shrew, that usually only lasts until I see something else I can work on. (That’s a useful tip by the way.) This sort of project will cost you more time and money than you have budgeted for - believe me! If you don't have the passion, vision and money for a project, you may not have the stamina for it. However, if you're a mad passionate motorcyclist, have a reasonable mechanical aptitude, no sense of the value of money and no wife/dependants, the Rabbit Hole awaits. =) Oh and lastly, at best you'll waste some money and a bit of time (it'll be more than worth it! ), but at worst you could lose your life. Do not rely on any of the solutions I have come by as optimal, especially mechanically. I recommend you obtain independent, qualified advice. And now, down the Rabbit Hole.